A little over a week ago Rich Perelman published some great cigar import data at his always interesting CigarCyclopedia. Among the figures was the fact that imports are running well up from 2006 and 2005. Looking at the numbers, though, prompted me to think about how important context is, and how you might want to utilize the data if (or when) your state is considering increasing its tax on cigars. I think the first thing to impress on any legislator is that for tax revenue, cigars are a poor resource to mine. On a state level, in fact, the cost of collecting and recording the taxes could come close to the amount paid. And that’s not even factoring in the potential cost if the state starts trying to police Internet sales or is forced to deal with a black market. Perelman notes that the record for premium cigar imports was 417.8 million in 1997. This year, he says, the figure might approach 335 million. While it’s difficult, if not impossible, to get an accurate figure on the number of people who smoke premium cigars on any sort of regular basis, the figure I’ve seen most often is about 1 million. Even if you want to multiply that by five, it still pales when compared to the number of cigarette smokers. There are 45.1 million of them, according to the CDC. Perhaps the legislator will reply that, rather than increasing revenue, the goal of higher taxes is lowering underage smoking. You then might want to point out that virtually no children smoke premium cigars, either unaltered or stuffed with marijuana. As evidence, the CDC notes that the two brands preferred by those 12 and above are Black & Mild (22.8%) and Swisher Sweets (14.4%). If cutting underage smoking is the goal, and the legislature believes increasing the cost will help accomplish that, then it should focus on the cigars favored by that group. For example, cigars that include paper, homogenized tobacco, plastic tips, etc., could be taxed at a much higher rate than those containing only tobacco. Is that fair? Probably not, but then is it fair to tax beer, wine, and distilled spirits at vastly different rates? Again, probably not. But states do so all the time. The truth is that the biggest impact of a major increase in the cigar tax is likely to be the bankruptcy of small business owners who have cigar shops in the state. I would hope, though, that facts would make an impression on least some reasonable lawmakers. 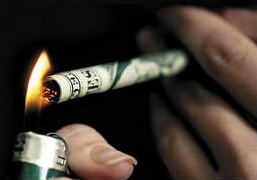 Speaking of taxes, Congress is raising tobacco taxes again on cigarettes.